Port Sunlight. Located on the south bank of the River Mersey on the Wirral Peninsula. The creation of Lord Leverhulme of Bolton-le-Moors (1851-1925) who was William Lever, a grocers son from Bolton, Lancashire who founded the Lever Brothers empire, now known as Unilever following a merger. Similar in principle to the Cadbury village at Bournville as an exercise in industrial philanthropy for the workers at the Sunlight Soap factory which is next door. This was based on Lord Leverhulmes non-conformist religious background and his leaning to the Arts and Craft movement. Port Sunlight was built with 3 or 4 bedroomed houses, shops, a museum, library, hospital and a teetotal pub. This photo shows the Art Gallery and museum (with cafe). 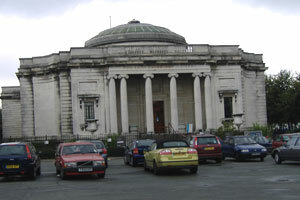 The Art Gallery is particularly impressive and contains Lady Leverhulmes art collection. A good short day out particularly if you like the gallery and feel the inspiration from learning about someone who came from a fairly modest background created a business empire. Also being in the village with its luxurious workers housing for the time but mixed with a strong religious and work ethic.